Claims adjudication is an important task for insurance providers as it prevents instances of duplicated claims, unwanted claims, delayed execution, etc. Even the right claims when mismanaged can have adverse effects on the company. Inefficient healthcare claims adjudication will eventually adversely affect the firm's revenue. So it is important to streamline this process by outsourcing it to a reliable service provider. Outsource2india has been offering offshore claims adjudication services to large insurance carriers and TPAs (third-party administrators) for over 20 years now. Our claims adjudication approach is simple - engaging a team of experienced and qualified claims adjudicators and a team of IT professionals to deliver efficient adjudication solutions to payers. We provide you with a blend of skilled resources, efficient processes, quality systems, and advanced technology, to assure exceptional quality, increased efficiency, and significant cost savings. Outsource2india has been providing global clients with high-quality healthcare claims adjudication services for almost two decades now. Being in the industry for so long, we have the required knowledge and experience to efficiently carry out claims adjudication and can cater to any type of client requests. 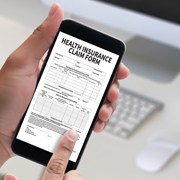 In this step, medical claim examiners check the claims manually. It is common for nurses and doctors to perform manual checks and compare the medical documentation with the claims. This step is performed for any type of medical procedure and is especially done for a procedure which is not listed. Why Choose Us for Claims Adjudication? Outsource2india is a leading company outsourcing claims adjudication services in India and a gamut of other healthcare BPO services to global clients for over 20 years. All our clients have benefited from our high-quality services and operational efficiency. The team at O2I is flexible in adjudicating claims payment by either using the customer's payment system or our own in-house claims system. Whatever claims adjudication requirements you have, we are capable of taking care of your claims adjudication process needs in a professional manner. Get in touch with us today to discuss your project needs.